The Series 7940 multitube flowmeters are available in either Aluminum or 316 Stainless Steel and in two basic configurations. 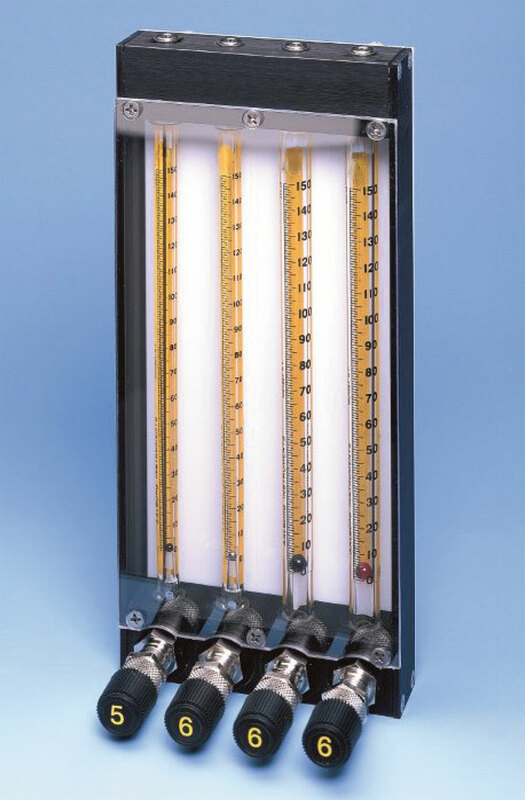 7940 Series has four flowmeter tubes with individual outlets to permit the metering of four separate gas streams. It comes complete with four tubes. 7941 Series mixers have three flowmeter tubes and a mixing tube with a single outlet to produce homogenous mixture of three gases to an accuracy of ±10%. The tubes have a single glass float and calibration curves for most common gases are available at no extra cost. All units are back pressure compensated by mounting the control valves on the outlet. All are available with a standard valve cartridge or a high accuracy valve to permit very accurate setting of low flow rates. All units are provided with a bench stand. Shipping Weight: 6 3/4 lbs. * Specify your choice of Flowmeter tubes from the table on page 53.